Unless you were lucky enough to be born with picture-perfect hair — immune to frizz, breakage and flyaways (yes, Gisele, we’re talking to you) — you’ve got a hair hang-up or two. Everyday wear and tear, plus harsh hair habits such as daily blow drying, wielding hot tools like curling irons and getting chemical straightening treatments, punish your strands. The result? Frizzy, crispy, lifeless hair that’s chock-full of split ends. Rather than putting up with a slew of self-esteem-blowing bad hair days, you can take smart steps to handle these hairy situations. Here’s how to tame your mane and get the healthy, radiant hair you crave. Most breakage occurs from everyday wear and tear. Everything you do to your hair — brushing, blow-drying, styling — can tear it. 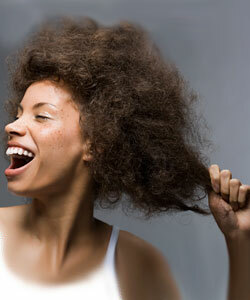 The less you mess with your hair, the less breakage you’ll likely have. Treat your hair like a delicate silk blouse and go easy on the vigorous brushing, scorching heat and tight clips. If your mane isn’t as full and lush as it used to be, your hair may be thinning. Maybe your ponytail is getting skinnier, or you can see more of your scalp through your part — a sign of allover, evenly dispersed thinning — or you’ve noticed thinning in small patches. General thinning is usually due to the natural aging process and hormonal changes, but diet, medical issues, some prescription medications and stress can all be a factor. If you think your hair is unusually thin, consider talking to your doctor. In one UK study, 67 percent of the women in a thinning-hair group had the endocrine disorder polycystic ovarian syndrome. If you regularly wear your hair in tight braids or twists, or if you sleep in tight rollers, you might be experiencing traction hair loss, which is when constant tugging on the hair follicle causes patches of hair loss. Sometimes a small bald patch is the first sign of alopecia areata, a disease that causes hair loss. If you can’t think of a reasonable explanation for your thinning hair, see your doctor immediately. During pregnancy, your hair may feel thicker because estrogens extend the growth cycle, leading to longer hair that’s less likely to fall out. Though most common lore says hair always gets thicker, that isn’t the case for a whopping two-thirds of women who see no change or even thinning hair during pregnancy. After birth, your hair may fall out in clumps as the growth cycle shortens again. Don’t worry; you’re not balding! Your system is just resetting. The changes you see are rarely permanent — hair typically goes back to normal over time. 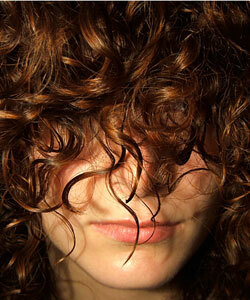 Fine, curly hair is most prone to frizz, but any hair type can get frizzy. Hair is dependent on the whims of humidity, because hair expands when exposed to dampness and reverts back to whatever your natural texture is (unless you have a permanent straightening treatment). The healthier the hair, the less likely it is to frizz, and anti-frizz products can help to some degree. Flyaways are usually broken pieces of hair sticking out at a jagged angle. Do whatever you can to prevent breakage (deep-conditioning masks, chilling on the hot tools) and get your hair trimmed every six weeks to eliminate frayed ends. Truth time. There is no such thing as a split-end mender. The only way to get rid of them is to cut them off. If you’re prone to split ends, regular trims (every six weeks) can help control them. If your ends are getting super-tangled and hard to comb, you may consider cutting your hair to a shorter length. Split ends are caused by daily wear and tear, hot tools, blow dryers, brushes — anything that damages the hair. When you notice split ends or tangled hair, it’s time to crop those locks. Flat hair with no body or bounce is usually a fine-haired gal’s problem, because the extra oil glands in fine hair produce more sebum, which makes hair appear heavier. Dry shampoo can do wonders for absorbing oil and lifting the roots. Thicker-haired folks might start to see limpness if their hair is thinning. This could be due to aging, but if your hair is thinning and it seems out of the ordinary, see your doctor stat. Although ladies with fine hair might kill for some of your volume, your hair can be hard to manage. The key here is getting the right haircut for your hair type. Investing in a great cut can make all the difference in the world. Shine happens when the cuticle (outside layer of hair) lies flat and reflects light. The healthier the hair, the shinier it is. Overuse of hot tools or multiple chemical processes damage the cuticle layer and rob hair of its beautiful luster. Heat-protectant styling products (to use before tools) can help. Everyone has a unique hair growth cycle, which determines how long your hair grows before it falls out. A shorter cycles means you can’t grow your hair past a certain point — sometimes that’s shoulder length. Although there isn’t much you can do about this, also consider that your hair is breaking off before it can reach its potential length. Getting your hair trimmed every six weeks will eliminate frayed ends and help your hair reach its full potential. Tangles happen when the cuticle (the outside layer) gets roughed up and clings to neighboring strands like Velcro. Chemical processes, hot tools and everyday wear and tear are tough on the cuticle. Be gentle when combing out tangles so you don’t make the damage worse. A dollop of conditioner on the area will help your comb slide through smoothly. Greasiness most often happens in fine hair, but it can strike anyone. If you frequently use silicone-rich hair products, wax or pomade, your grease might be from product buildup. Alternate in a clarifying shampoo every three to four washes. Also, dry shampoo can be a godsend for sopping up oil at the roots and adding volume. There are tons of reasons you might have dry hair: chemical processing, frequent dips in a pool, overuse of a blow dryer or just plain ol’ genetics. Dryness leads to damage, since it reduces the number of hydrogen bonds in your hair (which give your strands flexibility) and weakens its resistance to daily stresses like brushing or combing. Hydrating shampoos and conditioners can help, as can adding an omega-3 supplement to your diet to add moisture from the outside in. Water fades color. In fact, up to 80 percent of color fade is due to water alone. Your hair absorbs water, and as your hair dries, the dyes drain out with the water. If you’re a staunch everyday washer, try every other day. To stretch out the time between washes, try a dry shampoo on your roots to absorb oil and pump up volume (available at salons or drugstores).